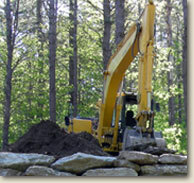 We are one of Southern Vermont’s most reputable excavating contractors, providing quality work for both residential and commercial needs since 1976. With the experience to serve our clients, we offer high quality work at affordable prices, done right the first time. With five excavators, three dump trucks, and much more equipment, we have the equipment and resources to complete your job on time and on budget. Located in Stratton, Vermont, we serve Bennington, Windham, and surrounding counties. Including areas surrounding Stratton and Mt. Snow ski areas.